All chickadees wear caps and Michigan's Black-capped Chickadee is no exception. Their cap and bib are black, which sets off their white cheeks and belly. Their soft gray back and wing feathers complete their dapper outfit. The Black-capped Chickadee's chick-a-dee call is easy to recognize, but as we near Valentines day listen for the loud whistled chickadee fee-bee-beeyee (like they are singing hey sweetie). This call is used to attract mates or strengthen pair bonding. As we head in to spring chickadees begin to explore potential nest sites (bird houses) so that as soon as the flocks begin to break up for breeding, each pair can claim a territory within their home range. As chickadees dispute territory rights, the loud whistled fee-bee-beeyee songs become a familiar sound. 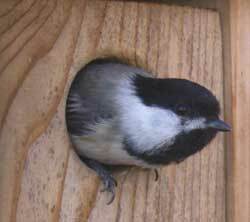 You’ll hear male chickadees engage in prolonged fee-bees battles with their male neighbors. Besides defending a territory a male must woo his mate by feeding her tasty treats. The female receives her gifts with a broken dees vocalization made exclusively by the females. 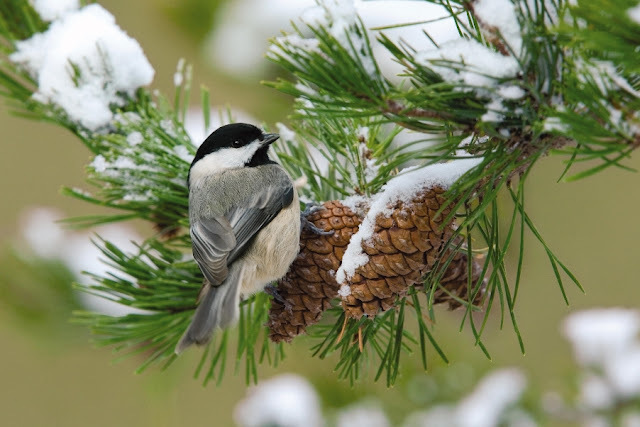 Mid-Michigan's chickadees are non-migratory and will be around all winter. Keeping their little half ounce body working efficiently requires a lot of fuel. From sunrise to sunset, the chickadee spends most of its time feeding. An ample supply of foods, such as good seed blends, suet, seed cylinders, or nuts, provide a lot of calories to produce energy in cold weather.